January 21: Launch of Relay 2. 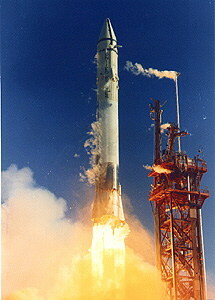 January 24: Successful launch of Saturn I – SA-5. This was the first launch of the Block II Saturn I with the S-I first stage and the S-IV second stage (powered by six RL-10 engines). This was the first orbital launch of a Saturn I.
January 30: Launch of the first of the Block III Ranger spacecraft, Ranger 6. Impacted Mare Tranquillitatis on 2/2 but failed to return images. February 19: Launch failure of Venera 3MV-1 #2 (attempted Venus flyby). February 20: Launch of Echo 2. February 20: Gemini Projects Office canceled the paraglider landing system for Gemini and determined that all Gemini landings would be water recovery. This was not announced to the public until August. Early 1964: Alan Shepard experiences several episodes of severe dizziness, vertigo, and nausea and is diagnosed with Meniere’s disease. This results in his disqualification from the astronaut corps. March 21: Launch failure of Luna E-6 #6 (attempted Lunar soft lander). Failed to reach earth orbit. March 21: Completion of the Mission Control Center (Building 30) at NASA JSC. specifically designed to make optimum use of remaining onboard systems in the event of failures in the inertial guidance system platform, computer, or radar. March 27: Launch failure of Venera 3MV-1 #3 (attempted Venus flyby). Fourth stage did not restart. Also called Sputnik 27. April 2: Successful launch of Zond 1 (Venera 3MV-1 #4). This was a Venus flyby that suffered communications failure enroute (the closest approach was 62,000 miles on 7/4). April 8: Launch of Gemini 1 (GT-1) from LC-19. Mission successful after 3 orbits, spacecraft burned up on re-entry as planned after 64 orbits. April 20: Launch failure of Luna E-6 #5 (attempted Lunar soft lander). Failed to reach Earth orbit. May 11-14: Space Medicine Branch meeting in Miami Beach, Florida. James G. Gaume, M.D. was elected President. Guest Speaker was Congressman Daddaria from Connecticutt. Maj. Gen. Otis O. Benson, M.D. received the Strughold Award. May13: Little Joe II (A-001) launch with a boilerplate capsule (BP-12) from White Sands Missile Range. It performed a successful LES abort at an altitude of 15,400 ft.
May 28: Launch of Saturn I – SA-6 from LC-37B. The payload was a boilerplate Apollo spacecraft (A-101). Launch was successful despite the failure of a center H-1 engine. May: At an international conference, Vasily V. Parin (Director of IBMP) states that it is doubtful that man can function much past seven days in space as Bykovsky and Tereshkova displayed severe orthostatic hypotension on return from their four-day space flight. They did not show return to normal cardiovascular function until 10 days post-flight. June 8: The entire complement of astronauts began launch abort training on the Ling- Temco-Vought simulator. Group 1 (selected April 1959) and Group 2 (September 1962) astronauts averaged approximately 100 runs each whereas Group 3 (October 1963) astronauts completed 32 runs apiece. 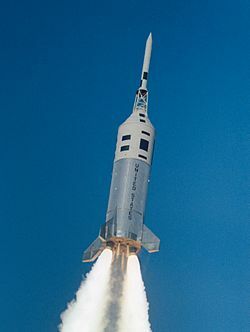 The Gemini-Titan 3 launch profile was simulated in detail, including such cues as noise, vibration, pitch and roll programming, and other motion cues which results from various launch anomalies. The training was completed July 30. June 30: Launch failure of Atlas Centaur 3 from LC 36A. One of the RL-10 turbopumps failed. July 28: Launch of Ranger 7 that successfully impacted the Moon (Mare Nubium) on 7/31 and sent back 4308 images. August 19: Successful launch of Syncom 3 (geosynchronous communications satellite) on the maiden flight of the Delta D launch vehicle. August 28: Successful launch of Nimbus 1 (Air Force weather satellite) into a polar orbit from Vanderburg AFB). September 1: Launch failure of the first Titan IIIA from LC-20. This was a Titan II with a third (transtage). The transtage failed to pressurize. September 18: Successful launch of Saturn I – SA-7 from LC-37B. The payload was a boilerplate Apollo spacecraft (A-102). October 12: Successful launch and mission of Voshkod 1 on only a 16-orbit flight. First multi-manned spacecraft. First medical doctor in space. First soft landing on the ground. 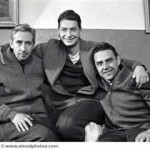 The three cosmonauts were Vladimir Komorov, Konstantin Feoktistov, and Boris Yegorov, M.D. The spacecraft was too cramped to wear spacesuits and there was no mechanism for launch abort. Training time for the crew was less than four months as there was a switch of crewmembers for political reasons. Backup medical doctors were Aleksi Sorokin, M.D. and Vasili Lazarev, M.D. October 31: Astronaut Theodore C. Freeman was killed in a T-38 crash on approach to Ellington AFB. He lost engine thrust after a bird strike and ejected at low altitude. He was the first astronaut fatality. November 5: Launch failure of Mariner 3 from LC-13 on a Delta D launch vehicle. The payload shroud failed to detach preventing deployment of the solar panels. November 16-18: The “Third International Symposium on Bioastronautics and the Exploration of Space” was held by the School of Aerospace Medicine in San Antonio. It was sponsored by Maj. Gen. Theodore Bedwell and Dr. Hubertus Strughold. The presentations were later published as a book. Ref – Bedwell TC Jr., Strughold H. “Bioastronautics and the Exploration of Space –Third International Symposium”. Publisher: John Wiley and Sons. 1965. November 28: Successful launch of Mariner 4 from LC-12 on a Delta D launch vehicle. Closest approach to Mars was 6,118 miles on July 14, 1965. The data collected radically changed the perception of Mars. Extensive cratering found on the 22 photographs that were taken indicated that weather and water erosion had been minimal for several billion that the surface was not protected from solar radiation. The atmosphere was calculated to be only 4.1-7.0 millibars by radio occulation. This was a tenth of the predicted result and meant that water could not exist in liquid or even solid form. The polar caps therefore were now realized to be composed of CO2 dry ice and not water ice. It also indicated that the atmosphere was almost all CO2 and without water vapor or nitrogen. The conclusion was that Mars was Moon-like and not Earth-like. November 30: Launch failure of Zond 2 (Mars 3MV-4A #2). Communications were lost enroute. The spacecraft flew by Mars on 8/6/65 with a closest approach of only 1500 km. December 8: Launch of Little Joe II (A-002) with a boilerplate Apollo capsule (BP-23) at White Sands. A successful LES abort at max q dynamic pressure at an altitude of 29,500 ft was demonstrated. December 9: Attempted launch of Gemini II (GT-2) which resulted in a launch pad abort due to loss of first stage hydraulic pressure prior to release of the hold down. December 10: First successful launch (second attempt) of a Titan IIIA from LC-20. December 11: Launch failure of an Atlas Centaur (Atlas Centaur 4) from LC-36A with the Surveyor mass model. Centaur stage failed to restart. Guedry, FE, Kennedy, RS, Harris, CS, Graybiel, A. Human performance during two weeks in a room rotating at three rpm. JAM 1964 35: 1071-1082. Bartlett, RG, Swet, CJ. Cornucopia two-gas atmosphere system for man in space. Bongers, LH. Sustaining life in space–a new approach. Cohen, LA. Human spatial orientation and its critical role in space. travel. Hazel, J. Radiation hazards and manned space flight. McCally, M. Plasma volume response to water immersion: Implications for space flight. Miller, PB, Hartman, BO, Johnson, RLLamb, LE. Modification of the effects of two weeks of bed rest upon circulatory functions in man. Miller, PB, Johnson, R LLamb, L E. Effects of four weeks of absolute bed rest on circulatory functions in man. JAM 1964 35: 1194-1200. Schaefer, HJ. Radiation field inside space vehicles. Schaefer, HJ. Radiation monitoring on Project Mercury: Results and implications. Schmidt, I. Is there a moon illusion in space? Seeler, HW. Complete emergency life sustaining system for spacecraft. Whitset, CE. A Mathematical Model to Represent Weightless Man. Lamb L. An assessment of the circulatory problem of weightlessness during prolonged spaceflight. 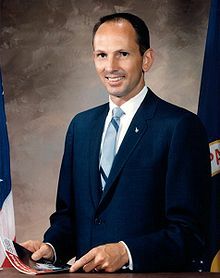 White SC, Berry C. Resume of present knowledge of Man’s ability to meet the space environment. Katz FH. Adrenal function during bedrest. JAM 1964 35: 849-851. Coe CS, Christensen C. Carbon dioxide management in spacecraft atmospheres. Weber TB, Dickey JR, Jackson NN, Register JW, Conkle MS. Monitoring of trace constituents in simulated manned spacecraft. Schone H. On the role of gravity in human spatial disorientation. Zalusky R, Ulvedal F, Herlocher JE, Welch BE. Physiologic response to increased oxygen partial pressure. III Hematpoesis. Montgomery PO, Rosenblum E, Stapp B. Gravity, radiation and growth. Herlocher JE, Quigley DG, Behar VS, Shaw EG, Welch BE. Physiologic response to increased oxygen partial pressure. I Clinical Observations. Colehour JK. The effects of Coriolis acceleration during zero gravity parabolic flight. Bush WH. Carbon dioxide measuring systems for manned spacecraft. Geber WF. Hemodynamic variations in the anaesthesized dog during simulated weightlessness. Cutler RG, Robertson WG, Herlocher JE, McKenzie RE, Ulvedal F, Hargreaves JJ, Welch BE. Human response to carbon dioxide in the low pressure, oxygen rich atmosphere. Lynch VH, Amman ECB, Godding RM. Urine as a nitrogen source for photosynthetic gas exchangers. Lamb LE, Johnson RL, Stevens PM, Welch BE. Cardiovascular deconditioning from space cabin simulator confinement. Robertson WG, Hargreaves JJ, Herlocher JE, Welch BE. Physiologic response to increased oxygen partial pressure. II Respiratory Studies. Stapp JP, Taylor ER. Space cabin landing impact vector effects on human physiology. Chianta MA, Stoll A. Effect of oxygen enriched atmospheres on the the burning rate of fabrics. Miller PB, Hartman BO, Johnson RL, Lamb LE. Modification of the effects of two weeks of bed rest upon circulatory functions in man. Giovanni CD, Birkhead NC. Effect of minimal dehydration on orthostatic tolerance following short term bed rest.